About 120 species, in the warmer regions of both hemispheres. The English name Three-awned Grass is applied to all the species. 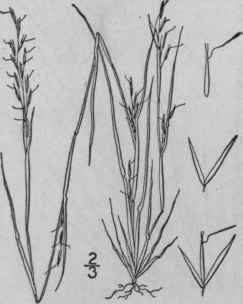 Type species: Aristida adscensionis L.
Awns not articulated to the scale. Central awn coiled at the base. commonly 3 1/2"-4 1/2" long. First scale much shorter than the second (often but little more than l/2 as long), which is 5"-8" long. five times their length, its straight portion 2l/2"-4" long. from 1/2 again to twice their lenth, its straight portion s"-8" long. Central awn not coiled of the base. Panicle narrow, linear to oblong, branches short (or long in no. 13), erect or ascending. Central awns and sometimes the lateral ones also stronlgy reflexed, the bend semicircular. Central awn from erect to spreading with no such bend at the base. First scale much shorter than the second, usually about 1/2 as long. Spikelets not crowded, usually 1-3 on branches naked at the base. Second scale of spikelet 8" long or less, equalling or exceeding flowering scale. First scale from a little shorter than to exceeding the second. Spikelets exceeding 10" long; first scale 5-7-nerved. Spikelets less than 8" long; first scale 1-3-nerved. Leaf-sheaths glabrous or sparsely pubescent. First scale generally shorter than or equalling the second. Flowering scale 2l/2"-2" long, its central awn usually 3"-5" long. Flowering scale 3 1/2"-4 1/2" long, its central awn exceeding in length. First scale exceeding the second. Leaf-sheaths, at least the lower ones, densely wooly. Panicle diffuse and open, the branches very long and widely spreading. Awns articulated to the scale, united at the base into a spiral column. Column conspicuous, 3" long or more. Column inconspicuous, 1" long or less.